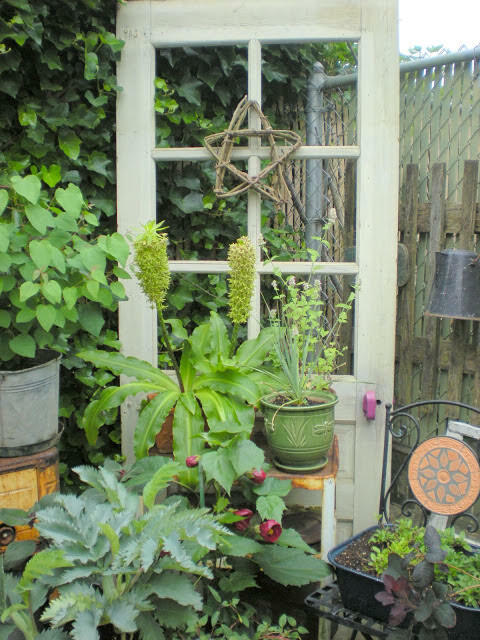 Take these great ideas and find an inexpensive door in the home improvement center, pick up a vintage window at the salvage yard, or create your own door and window “look” with an element of new construction. 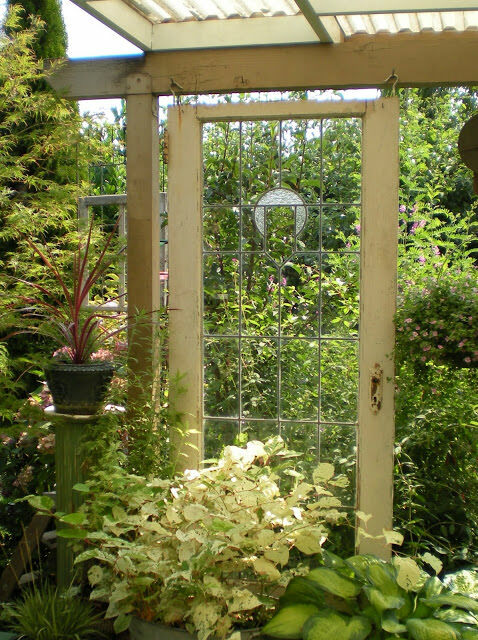 But bring in a “passage-way” to your garden, (whether real or implied) and you will have a hard time keeping visitors out! 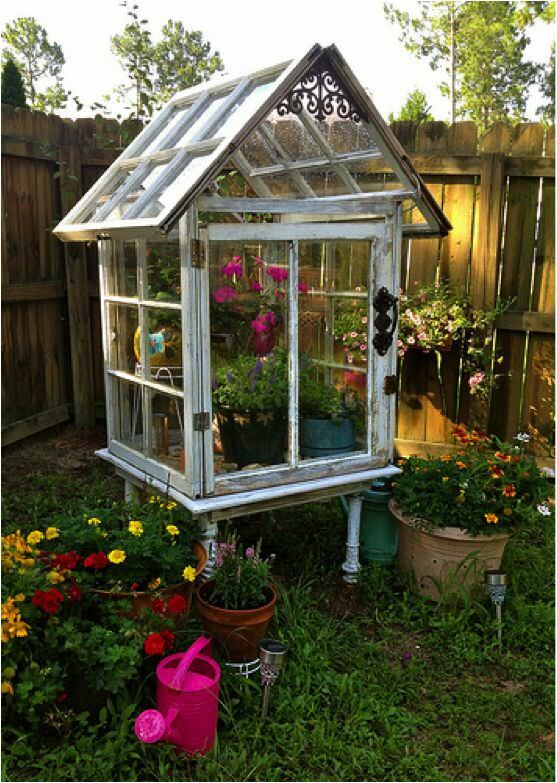 Below, is from ‘Paintbox Garden‘ via ‘Houzz’. 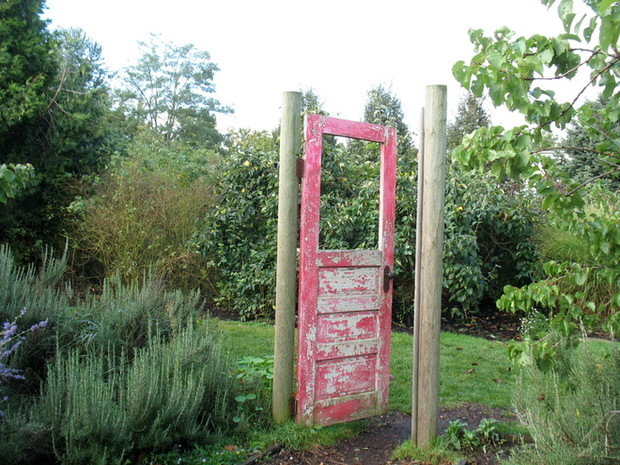 This would be an easy way to mount a freestanding door as a gate in the garden. Simply by sinking two large wood poles as a doorframe, you will have a sturdy structure. 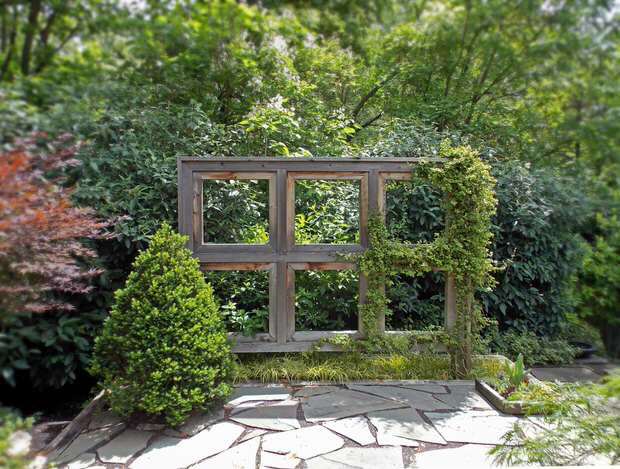 These two wood doors were repurposed by ‘BHG‘ to create this fresh take on a garden arbor. You could also use wood posts behind the doors as support here. We would recommend using a quick setting concrete to set the posts into their holes, then screw the doors into the posts. 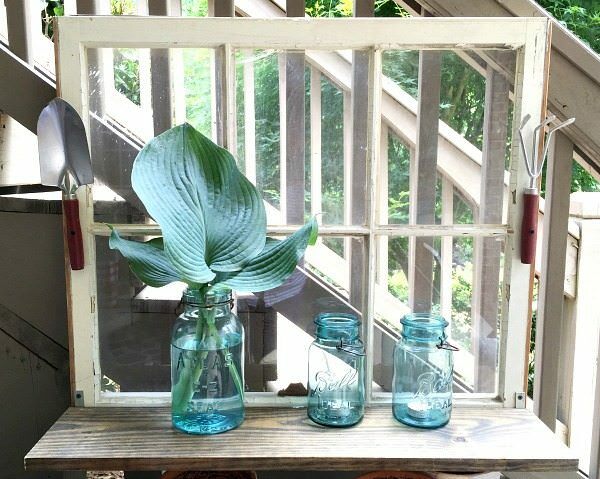 Lovin’ this repurposed window garden shelf tutorial from Debbie at ‘Refresh, Restyle‘! Easy project and the garden tool handles made me smile, and I love the whimsy. 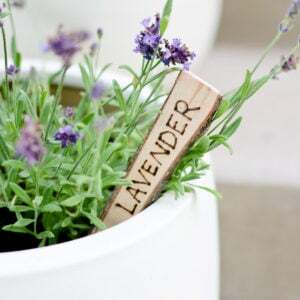 Want a cute garden decor piece? Love birds, like I do? Then try this quick and easy tutorial from Teri at ‘Hometalk‘. 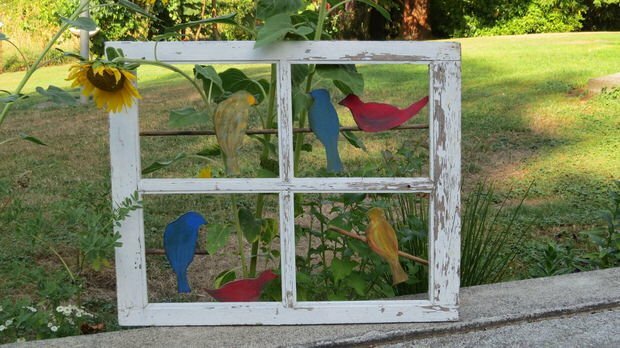 She got the window frame for free, then cut and painted the birds herself from plywood. Could you find some precut versions at the craft store? 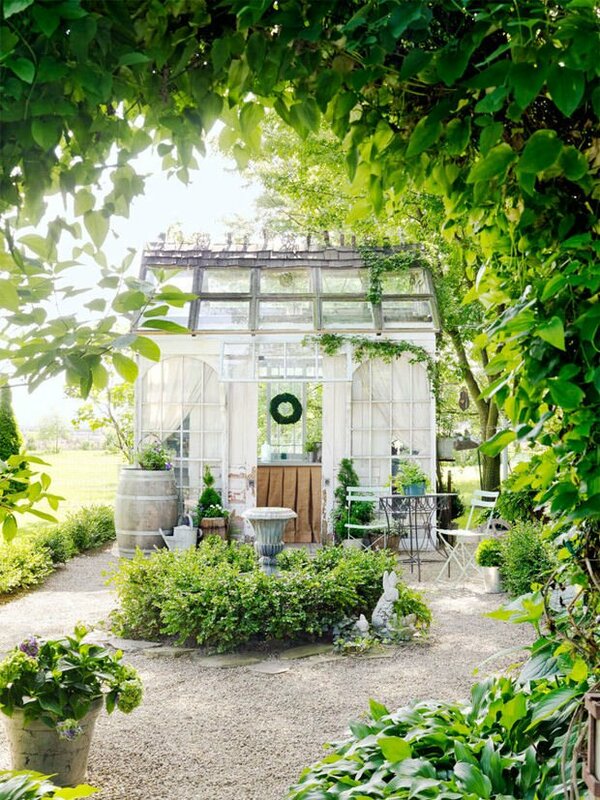 From ‘Goessling Design‘ via ‘Houzz’, this homeowner had a window/garden like structure made to act as both an arbor and a patio fence as well. We saved the most amazing for last! From ‘Country Living‘, this “chic shed” from Donna Jenkins, owner of ‘Tinkerhouse Trading Company‘ is awwwww-some! Sorry, I just ran out of words cool enough for this garden! The greenhouse shed is made up entirely of windows. 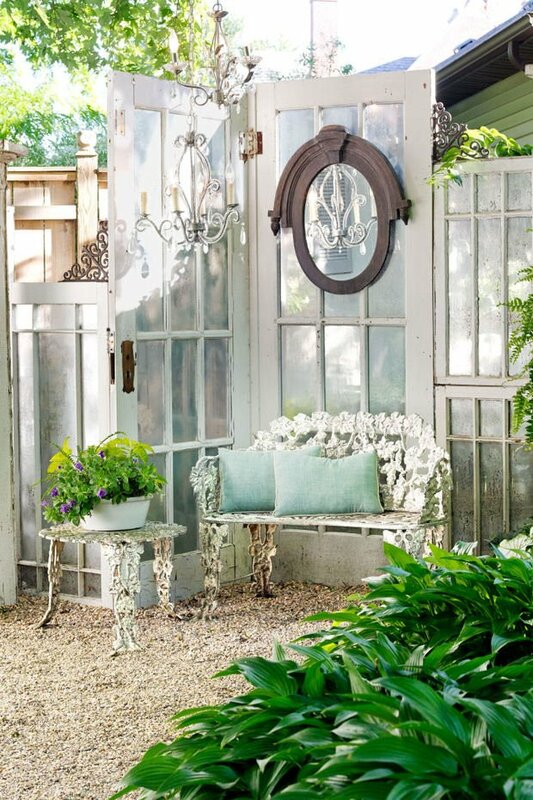 There are a couple of vintage doors making this one of the most enviable gardens we’ve seen this season! Check out the whole article, and watch for the opening of her online shop. Photos by Gridley and Graves. 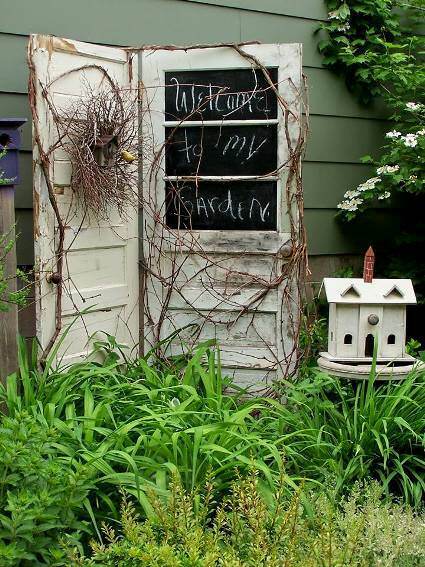 Not that you love windows and doors in the garden as much as we do, we think you will also love our posts on How to Add Garden Whimsy or DIY Garden Projects with Rocks! 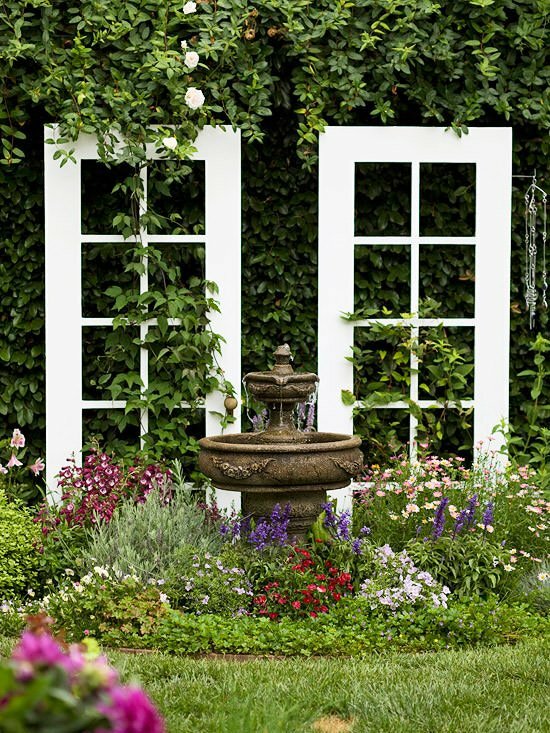 Adding sometimes the most ordinary items like doors and windows can do so much in boosting the look of the garden. Yes, it adds an air of mystery and often persuades guests to check out to see what lies behind the doors and the windows! I enjoyed the pictures so much! Thanks!! There probably was a time when I might have thought this tacky. But no more. I love it! My favorite are the two white doors sitting side-by-side. Stunning. When I was young, I always thought that putting these seemingly staple home fixtures outside of their intended place looks weird and somewhat off-balance. 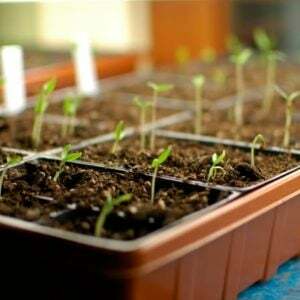 But come to think of it, it brings out the best in your backyard or garden, just like the ones you did here. Great ideas and designs, Kathy! I am a fan.